Once you've got your raw oscillators filtered into shape, the next step in turning your synth patch into a musically meaningful sound is modulation - ie, the movement of parameters such as filter cutoff and oscillator pitch over time. While envelopes are just the thing for creating one-shot triggered modulations, when you're after cyclical, regular rhythmic movement, the LFO - or Low Frequency Oscillator - is your best friend. In this tutorial, we'll show you how it works. For more sound design techniques, pick up the Autumn 2017 edition of Computer Music. Step 1: In addition to audible oscillators, most synths feature at least one Low Frequency Oscillator (LFO). As the name implies, an LFO is an oscillator that operates far more slowly - usually below the range of human hearing (sub 20Hz). It usually can’t be heard in itself in the signal path - it’s used to influence other synth parameters instead. Step 2: Let’s modulate the pitch of Dune CM’s first audible oscillator using one of the synth’s three identical LFOs. As with many synths, this is set up via a modulation matrix - In the central panel, open the Mod Matrix 1 > 12 tab, then set the Source to LFO1 and Destination to Osc 1 Semi. The more you drag the centre Amount value upwards, the more you’ll hear LFO 1 increasingly wobble Osc 1’s pitch. Step 3: The ‘shape’ of this pitch-wobbling is a smooth, up-and-down curve, because LFO 1’s shape is set to a sine wave. 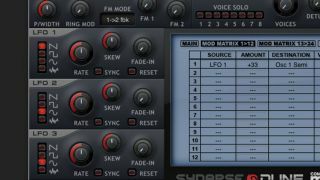 Click the four toggle buttons on LFO 1’s left to change between four shapes: Downward saw, a downwards sloping ‘zap’; square, a strict ‘on-off’ shape; a smoothly-curved sine; and sample-and-hold, an unpredictable, random shape. Try them out and hear how they each affect the pitch movement. Step 4: The LFO’s Rate control sets the speed at which it oscillates, measured in cycles per second, or Hertz. Increase or decrease this value to speed up or slow down the modulation. Most LFOs allow you to lock the speed to your DAW’s tempo - click Sync to do that in Dune CM. Now, when you change the Rate, the speed is set in rhythmic divisions of a bar - 1/2, 1/4, 1/8, etc. Step 5: Although we said that LFOs operate outside the range of human hearing (ie, below 20Hz), this isn’t always the case. Many LFOs, as with Dune CM’s, can actually be sped up to super-fast rates above 20Hz, which is known as audio-rate modulation. Detoggle Sync, then increase Rate to hear metallic sideband harmonics start to emerge. Step 6: Activate the Reset button, and the LFO modulation will restart with every new MIDI note. Fade-In allows you to delay the LFO’s onset, so it kicks it gradually as a note is played. Skew essentially bends the wave shape.